Who are the City Grinders? We are Street Thoughts official Street Team (Brand Ambassadors). Our mission is to bring awareness to the Streetz community, provide business opportunities for qualified grinders as well as exceed the expectations of our participating clients. Our structure is like no other because we build leaders from within as well as create job opportunities. We also provide creative services such as marketing/promotion, music distribution, product demonstration, focus groups, social media & facebook page management, etc. Our overall objective is to provide exceptional service to our clients, raise the bar when it comes to promotion/branding, build loyalty among-st our team and create fun/exciting new opportunities. 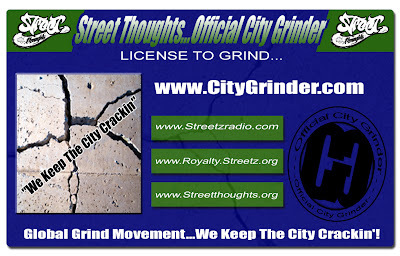 Street Thoughts official street team (City Grinders) is a movement that consists of talented individuals from all around the world. From Street Team to Digital Promotion, the City Grinders represent grinding at its fullest. While staying loyal to their position & the Street Thoughts community, official City Grinders stay true to their roots. Joining our movement will help unite real grinders in their purest form. Members will also experience grinder benefits such as worldwide promotion, radio play, magazine features, interviews, mixtape placement & more. There are also bonuses, prizes and cash commission business opportunities. Clients in need of promotion will be able to experience beneficial factors of the movement. To take grinding to a whole other level. To exceed the expectation of our clients. To build long lasting business professional relationships. To remain loyal to our customers, workers, community & grind. To build brand visibility & bring awareness to the Street Thoughts community. Want to be a City Grinder? We are currently accepting new members in your area to join our Street Team & become a Brand Ambassador. Just for helping us spread the word about our projects & community, we will in return help promote your project, business or website. We will hold you down by adding your information to our Street Team material as well as provide media promotion, magazine placement, website features, interviews & more. In addition you will receive free magazines, music and other promotional material. There is also an opportunity for you to contribute to our magazine, host your own radio show or even earn $$$. Interested in grinding? Please contact us for more info. Please put Brand Ambassador in subject/comment line. City Grinder recognizes individuals, groups, business, etc. for their work ethic, determination and overall grinding skills! The City Grinder Spotlight is a special recognition that will honor those that work hard and/or make a difference in the community. If selected, grinder(s) will receive a complimentary feature or shot out in an upcoming issue of Royalty Magazine. To be considered for this feature, you must follow us on twitter @CityGrinder to get details. 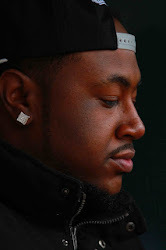 Off The Dome Ft. Twista- Break The Bank - Tacoma Spitters OTD is back with some new heat and this time they bought Chi Town veteran Twista along for the ride!! And they are here to "BREAK THE BANK!!"